Please join us for a screening of the film "Race to Nowhere," hosted by the Hunter elementary and high school PTAs. Created by mother and first-time filmmaker Vicky Abeles, the film is a compelling, honest look at how schools and parental pressure are affecting students' emotional and mental well-being. Advance tickets: $10 (plus $1.54 service charge). Cash tickets will be sold at the door for $15. A portion of the proceeds may be donated to HCCS, depending on the number of tickets sold. Click here to purchase tickets. 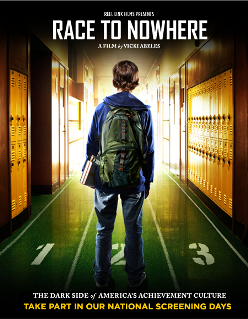 About the film "Race to Nowhere" explores the challenges some students face as they compete in the test-driven, pressure-packed academic environment that exists at many schools today. We hear from students who feel they are being pushed to the brink, educators who worry that students aren't learning anything substantive, and college professors and business leaders who are concerned that some younger employees lack the passion, creativity, and internal motivation to succeed. "Race to Nowhere" is a call to mobilize families, educators, and policymakers to challenge current assumptions about how best to prepare American children to become healthy, contributing and leading citizens. Learn more about the film at http://www.racetonowhere.com.